Preheat oven to 350°F (or 325°F for dark non-stick pans). Spray baking spray in two 8-inch round cake pans. Line bottom of each pan with a circle of parchment paper. Combine cake mix, powdered whipped topping, eggs, water, and oil. Use an electric mixer and beat on low for 30 seconds then increase to medium and beat for 2 minutes. Equally divide batter among the two pans. Bake for 30-35 minutes, until a toothpick inserted in center of each cake comes out clean. Remove cakes from oven and allow to cool in pans for 10 minutes. Remove cakes from pans, set on a cooling rack and allow to cool completely. Cut domed top off each cake. Cut each cake into two even layers. Set one layer on a round cake board or platter. Brush some lavender lemon simple syrup over the layer. Color white frosting using lavender icing coloring. Spoon frosting into a large pastry bag. Cut the tip off the bag and pipe circles of frosting over top of cake layer. Add the second cake layer, brush with simple syrup, and pipe on frosting. Repeat, adding the final two layers. When you remove the cakes from the pan, run your hand around the edge of the cake to remove any crumbs. Naked cakes are all the rage right now, and it's easy to see why they’re so popular. They’re super easy to make, yet look really stunning. If you’re not a fan of fussing with frosting the outside of a cake, this method is for you. You simply frost between the cake layers and leave them! 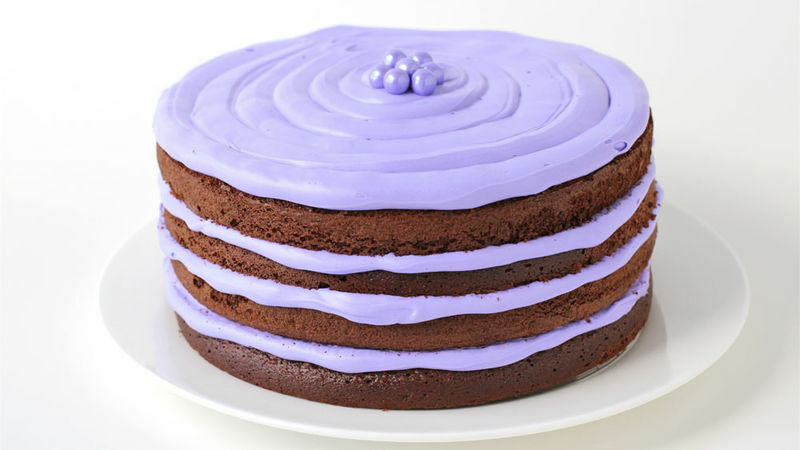 This cake has layers of lavender-colored frosting in between decadent triple chocolate cake. To enhance the flavor and match the color, the cake layers are infused with lavender lemon simple syrup. You can get bottles of the Royal Rose Lavender Lemon Simple Syrup I used online. To make sure you have nice thick cake layers, you'll want to add a bit of volume to the cake mix. To do this, add a packet of powdered whipped topping and an extra egg to the ingredients called for on the Betty Crocker® Triple Chocolate Cake Mix box. Equally divide the cake batter into two 8-inch round pans that have been lined with parchment paper and coated with baking spray. Bake the cakes for 30-35 minutes, until a toothpick inserted in the center of each comes out clean. Remove cakes from oven and allow to cool in pans for 10 minutes, then remove from pans and cool completely. Once cooled, cut the domed top off each cake and cut each cake into two even layers. Set one layer on a round cake board or platter. Brush some Lavender Lemon Simple Syrup over the layer. Pour 2 ½ tubs of Betty Crocker® Whipped White frosting into a mixing bowl and color using lavender icing coloring. Spoon frosting into a large pastry bag. Cut the tip off the bag and pipe circles of frosting over top of the cake layer. Serve as is or add a little decoration to the top!